It’s safe to say that Electro Harmonix are experts when it comes to creating a pure analog pedal, and the original Memory Man pedal was essentially one of the most widely demanded delay pedals released by this brand. The Deluxe Memory Man is a modern take on the initial pedal but it retains the original circuit in order to produce that pure, organic analog delay. Many guitarists still prefer an analog delay over a digital version, and the Deluxe Memory Man offers up to 550 milliseconds of dynamic repeats. Many other delay pedals don’t offer chorus, echo and vibrato, but the Deluxe Memory Man does, thus offering depth and versatility to your sound. The Blend dial allows you to control the delay against the pedal’s dry signal, while the Level lets you increase or decrease the signal output depending on the sound layers you want to distribute. The Feedback control enables you to ascertain the regeneration of the repeats that the pedal produces. 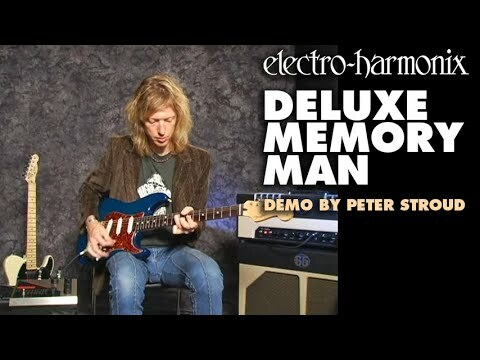 The Deluxe Memory Man includes an innovative Chorus / Vibrato dial which provide you with two different modulation types in the same pedal, while the Depth controls the intensity of either the Chorus or the Vibrato. The last control at the end is the Delay dial which is where you set your delay / repeat time. The Deluxe Memory Man pedal has a true bypass footswitch to engage with the pedal as well as a handy overload LED indicator which lets you know when you are feeding the pedal with too much signal. Electro Harmonix have included a 24VDC-100 power supply to run the pedal smoothly and efficiently. The Electro Harmonix Deluxe Memory Man is a superb tape delay pedal with the addition of chorus and vibrato effects to add both a shimmer and a flexibility to your guitar’s sound.